showcase your Selfie-love to the rest of the world. 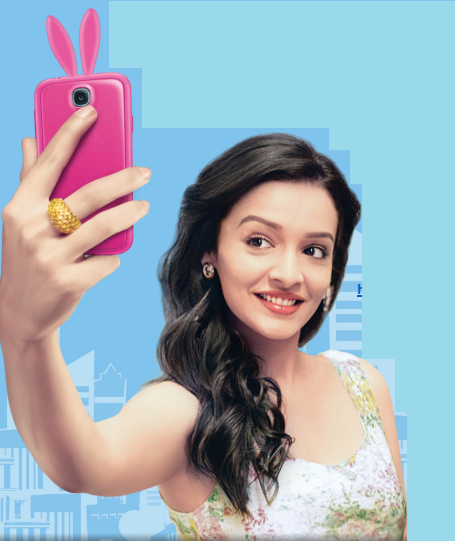 Visit the Pond’s “Selfie Ready” website http://selfieready.ponds.in/ and check out the engaging campaign video that gives one a glimpse into the colourful world of a young girl. The video captures her journey through life and shows how she is always Selfie Ready with Pond’s white beautyTM BB+ Foundation and Fairness cream. A visual treat by itself, the video invites participation to the Pond’s “Selfie Ready” conest. You can also share your selfies on Twitter, Facebook and Instagram using the hashtag - #PondsSelfieReady and download the peppy song from the Pond’s “Selfie Ready” website. The revolutionary Pond’s white beautyTM BB+ Foundation and Fairness cream is a girl’s best friend when it comes to taking the perfect Selfie. This first of its kind innovative beauty solution, combines the dual benefit of instant coverage of spots as well as lightening skin from within to help reveal perfect natural look that is “Selfie Ready”.  Adjust the angle of your smartphone, tilt it at 45 degrees just above your eye line …Snap! Now with Pond’s white beautyTM BB+ Foundation and Fairness cream, be “Selfie Ready” all day long! More about Pond’s white beautyTM BB+ Foundation and Fairness cream Pond’s, the pioneer in face care with over 160 years of face care expertise, offers the revolutionary Pond’s white beauty™ BB+ Foundation and Fairness cream. The first of its kind innovative beauty solutions from the Pond’s white beauty portfolio combines the dual benefit of instant coverage of spots as well as lightening skin within to help reveal perfect natural look. Pond’s white beauty™ BB+ Foundation and Fairness cream with SPF 30 PA++ and GenWhite TM cover formula provides natural coverage suited for Indian skin that conceals spot instantly while working from deep within epidermis to lighten stubborn spots for all day instant spot-less radiant skin. Clinically proven to lighten skin tone and reduce dark spots, GenWhite™ Formula is enriched with a powerful mix of Vitamin B3, Vitamin E, Allantoin and advanced superior sunscreen protection. Pond’s white beauty™ BB+ Foundation and Fairness cream is available at Rs. 75 for 9 gm, Rs.140 for 18 gm and Rs.325 for 50 gm. Pond's is a global face care expert that has a presence in over 50 countries including Asia (Philippines, Thailand, Indonesia, China, Vietnam, Korea and Japan) and USA - making it a skin care brand to reckon with. The brand boasts of state-of-the-art R&D facilities led from Ponds Institutes At New York, Tokyo and Madrid, helping it create international beauty solutions for the discerning woman. The Pond's philosophy is based on the application of leading-edge technology to face care, and giving customised solutions for different skin care needs. By combining this with an intimate understanding of the woman's skin care needs and requirements, Pond's delivers results women can see and feel. The girls who are on the wall of fame, and are chosen for lucky gift hampers, do they stand a chance to win this contest and be on the billboard ?